This morning was my second Fit Test for Insanity! If you don’t remember, I did the fit test way before Insanity and not on the first day because my knee was hurt from the race. Anyway, that still means I have numbers to compare to and they look great! I think some of the increase is knowing the moves now but some of it is also better fitness. So a great run and a great Fit Test! Loving this! And Callista who I ran with on Sunday is also starting. Can’t wait to see her progress too! 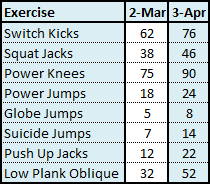 I did try doing today’s working of Plyometrics right after the Fit Test and that just wasn’t happening! I could barely do the warm up! I might skip it and just move on to tomorrow’s scheduled plan. On another note, I got a surprise package over the weekend and could not think of what it could be. 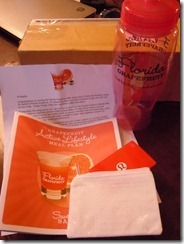 I opened it up and it was from the people at Florida Grapefruit! I can’t remember if I told you guys but I won a raffle that I entered at the DC Half Marathon! It was for a $250 Lululemon Gift Card!!!! I was just expecting an envelope in the mail but they also sent me an nice letter, a meal plan that has lots of grapefruit recipes in it and a cute pink water bottle! I have some grapefruit in the fridge so I can’t wait to try some of the recipes out! Oh and you know, go shopping!!! 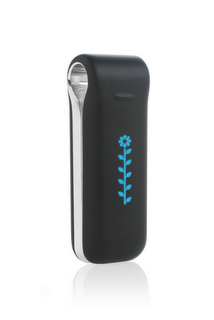 And yet another thing to talk about, I am FitBit-less this week. It stopped syncing last week and it was the third time it did this but the fix the tech team sent me didn’t help this time. Gr. The thing seems to be a little fluke-y but on the bright side, they are sending me a new one for free!!! So even though Lauren has her FitBit Graveyard and I am now on number 2, at least their customer service is pretty darn good! I love it too much to call it quits! Oh, and it arrived yesterday in NJ so Rob said he is holding it hostage. Can’t wait to get back my calories this weekend! Oh and that reminds me, I was starving yesterday! I told you guys how I am using My Fitness Pal to track calories? Well, it syncs with my FitBit and without that syncing, MFP has me eating almost 500-700 calories less than I should be!!! I sat down and tracked everything I did yesterday and couldn’t believe the difference! (Tracked “working at desk”, “standing, getting ready for bed”, “driving” etc.) Good thing I had listened to my body and eaten more calories than MFP was telling me. Funny thing is that after I made all those adjustments, I had eaten right in my correct range! Ha! Talk about knowing your own body! Alright, it is time to get some work done. I have lots of take home exams this week, its crazy! Looking forward to a weekend with Rob! Have a great, healthy day!! Awesome results! I did the first real workout this morning and it was intense! I had to take quite a few more breaks than the people on the DVD, but didn’t feel bad when he was asking them how many times they had already gone through the program. Keep up the good work! Yeah I never feel like I am doing bad which is one thing I love about the videos! You definitely go at your own pace! Half the time now, I don’t even look at the TV while I’m trying to push through a segment so that their pace doesn’t screw with mine. LoL! Wow! You’re really improving. Go, Ang! LOVE getting surprises in the mail! And how can you not love it extra, grapefruit is the best! Great work on the fitness test, too. I’m not sure what a suicide jump is, but I’m pretty sure doubling your number puts you in rock star status. GO girl!